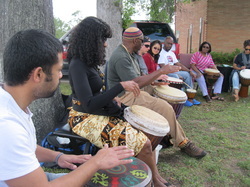 The Joy of Djembe Drumming co-facilitates a community drum circle at Levy Park on Sunday, October 22th. This community drum circle is a heart-centered and meditative experience that has been taking place for the past decade. 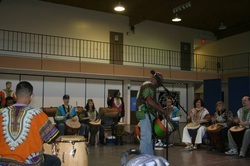 Joy of Djembe Drumming is pleased to support and co-facilitate this drum circle experience. It's FREE! Open to all ages. Facilitated by Gregg "Jebada" Powell in Galveston, Texas. Occasionally, on an evening of the full moon, Gregory Powell leads a group of drummers and dancers to states of bliss and joy through the power of drumming together in community. It is at 51st and Seawall Blvd. So come join us! It's FREE! * bring your drum and a chair! 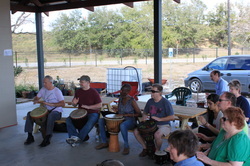 The Joy of Djembe Drumming Ensemble meets on the third Saturday each month from 2:00-4:30pm. 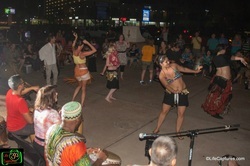 This drum circle is geared toward exploring cultural world rhythms and performing them as an ensemble. The musical compositions will comprise of several structural parts (i.e. poly-rhythms) interlaced with other percussion instruments such as shakers and bells. Each participant in the group is required to learn their parts in order to play with the ensemble. This type of orchestrating demands focus, attention and discipline. So those who are passionate and committed to drumming will find this forum both challenging, satisfying and rewarding. *Must be at least an intermediate level drummer, bring your drum!